Thoughts are like vapor. They come and grow and go as they came. With age they are harder to solidify. This is a painting done with 75¢ brushes. Bristles on the edge of control. Simple complementary colors with just a little contamination. Softened layers with big brushes. I can see more of this to come. A moving sky over Pine Point Maine. What can be more boring than blue skies. Gimme some clouds. Big puffy things .moving fast through blue yonder. Value is the most important thing most of the time when making a painting. Color in itself is value. Some short poses from Tuesday nights session. 15, 10 and 5 minutes. The element of time comes into play when drawing short poses. What do you do. How do you approach the paper. Try and express whole figure or just the essence. The sensitive placement of the hand. The elegant point of the toe or the rhythmic twist of the torso? Mostly there is little tome to choose. You make some quick measures and attack. First with the charcoal then with the chalks. No time to recheck proportions. Just trying to get the feelings. It’s not hard when the model is a dancer, an artist. Over the past several years I’ve been exploring color with a keener eye. Guided by my painting buddy Judith Reeve and he excellent blog Attentive Equations. 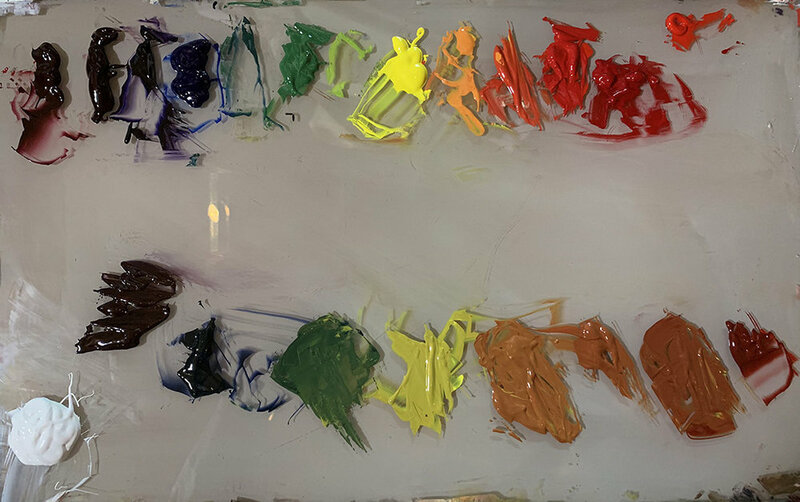 Over the years I would either work from a preset palette or a spectrum palette. I would build a 'sub-palette' from the resource painting from the sub-palette mixtures. Usually a photograph. I started seeing similar colors reappearing in my sub-palettes. I was seeing some of the colors on Judith palette and asked how she was getting them. It turns out that there is a logic behind color. The more I delve into it the more the simple logic of color is revealed. These are some books that help reveal color. 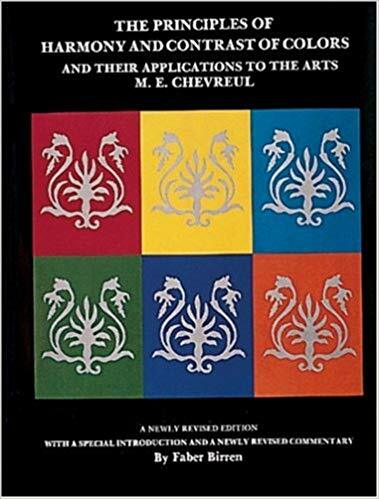 The Principles of Harmony and Contrast of Colors and Their Applications to the Arts by M. E.Chevruel. This is where the practical description modern color in the applied art begins. A tough read but essential. 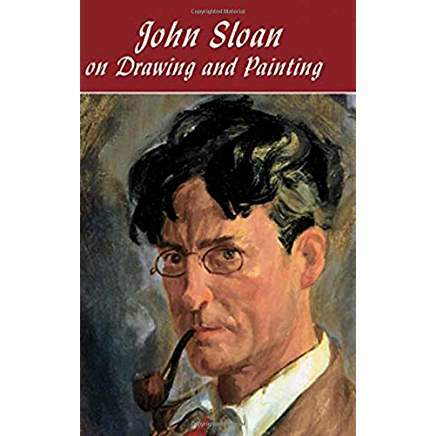 John Sloan on Drawing and Painting. A Dover Book. 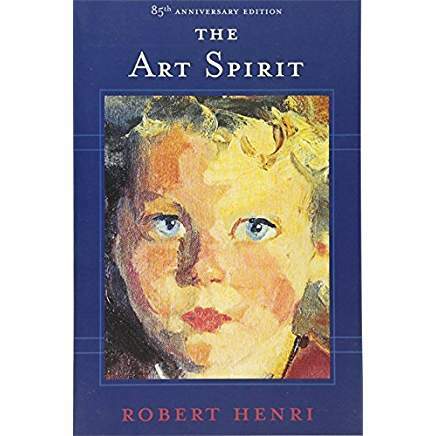 The Art Spirit by Robert Henri. A Dover Book. Two essential reads of the emmerging views of color from the early 20th century . Sloan begins to layout the his color principles. A painters palette; a theory of tone relations, an instrument of expression. Denman Ross. 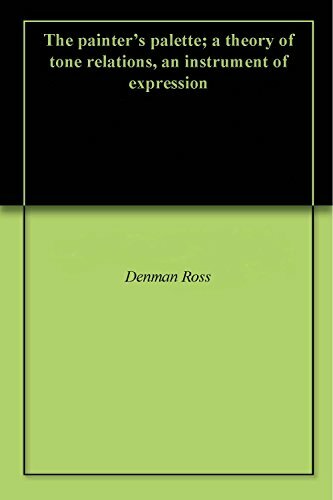 Forgotten Books An Introduction to the Language of Drawing and Painting. 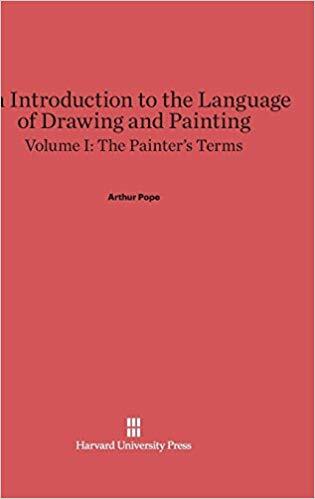 Volume 1: The Painter’s Terms by Arthur Pope. Harvard University Press A couple of Harvard guys who tried to unify tone and color. Fascinating but can be difficult. The challenge for me is to simplify for presentation. I’ve added this because it deals with color massing in a fun way. This is how color was taught in art school in the sixties. The continuing process off understanding Catherine. From Judith Reve’s drawing class, Drawing for art instructors, or something like that. After about a year we’ve all progressed to capturing this level of drawing in about 2 hours give or take. Drawing in like any effort. You learn it do it all the tome you get goo. But also fast. Cleaning out some draws to make room for stuff that I’ll clean out in a few years for more stuff. I found these. From my days on Beacon Hill at Kennedy Studios. Primo’s was around the corner. I did these and a lot more in trade for food. Yummy. I had a lot of fun those days. Too much fun if that’s possible. I was a cartoonists working in the alternative newspaper scene. Mostly for the Real Paper. Sometimes for the Boston Phoenix, the dark side. Here is a Phoenix piece. I bought some cortlands to make a pie. I think Cortlands make the best pies. I was fussing about in the studio and found this nest. So it just seemed like the right thing to do. I put an apple in it. Then I forgot it. I was cleaning the palette and saw the apple in the nest. I smelled it too. Time to paint . I painted it yesterday. Just stood up and painted it over the day. Scratching and brushing brushing and scratching until it was done. I think. Pretty much a neutral palette excepting the apple wihich has a lot of Raw color. Tomorrow Pie. 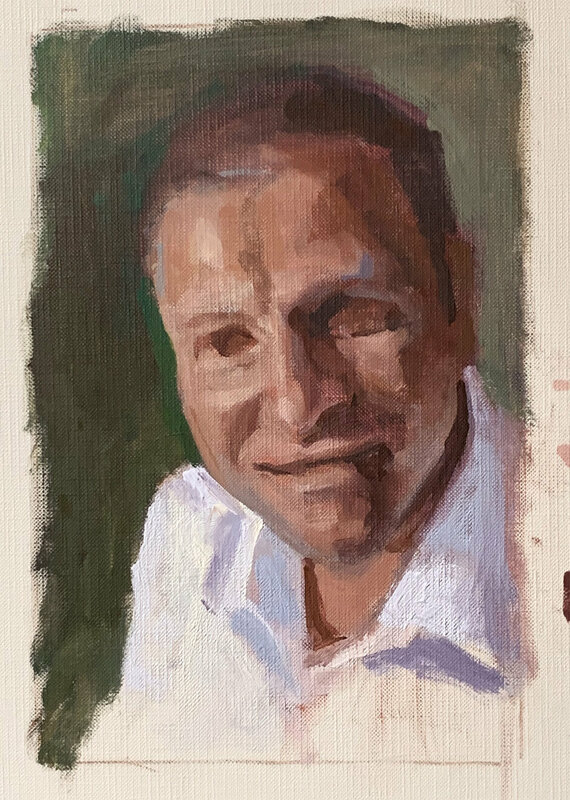 Last weekend I attended a Peter Fiore workshop. I alway get a boost of freedom when I paint there which I do several times a year. This time I was able to combine the looseness that I always seem to find there with my ever more focused approach to color. The base colors here are all semi—neutral colors derived from my 12 color spectrum palette. When I need a saturation boost I tint with a top line color. I’m not a conscious color temperature guy. I always figure if I see it I'll get it. Here I started out with the understanding of a two zoned color temperature palette. I think I succeeded. This is a tough painting to photograph will ail the thicker than usual brush strokes. Its pushing a little red in the sky. Most of the subtle touch strokes are evident though.